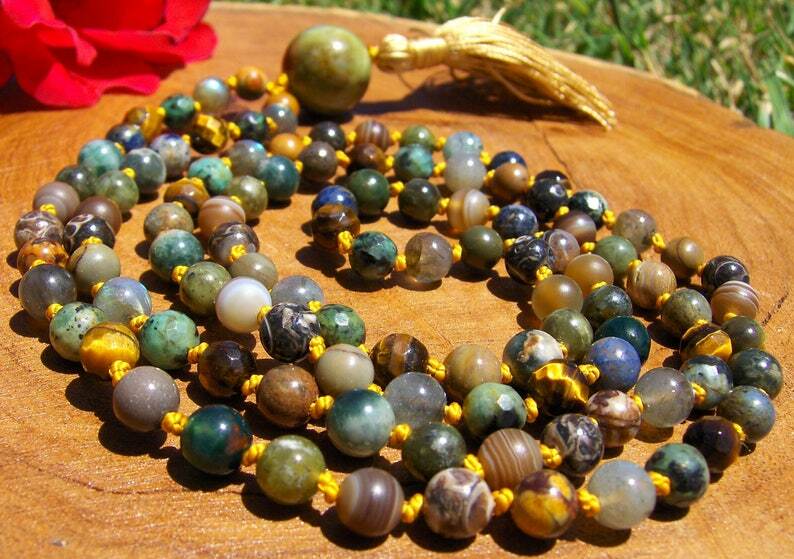 Part of my process in making malas is chanting or listening to mantra, so your mala has already been bathed in prayers to clean and clear your stones in preparation for receiving your prayers and intention. 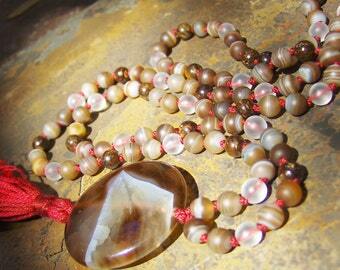 The beauty of receiving your mala directly from the maker is that it has not been handled by anyone else. I clear the stones before and while I work with them, then I smudge the completed mala before shipping it to you. 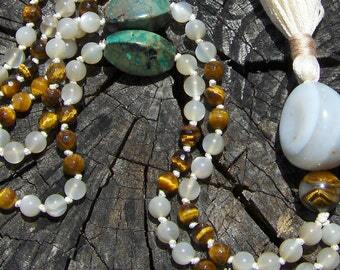 Every mala is unique & ready to help remind you of your work along your path. Part of being human is that we have an incredible opportunity to grow, transform and heal. We are here on this planet to make a difference - to uplift and enlighten. We all have our own process of doing that and your mala beads serve as a tool to help you focus and be present in the process of learning and growth. Green Calcite can be used to assist in the manifestation process, and to bring in the energy of trust, allowing that what has been manifested will be received. Use Green Calcite when working with the Heart Chakra to bring emotional balance and knowledge of Divine Love. This stone helps to dissolve old energy patterns and beliefs that may be holding you back. Green Calcite assists during times of mental change or big transitions. Use Green Calcite to help release the comfortable, old programs that you may be holding on to but which no longer serve you. A peaceful stone, Green Calcite can help one to look at situations differently, with the knowledge that, whether good or bad, "This too, shall pass". Physically, Green Calcite stimulates the immune system. Rigid old ideas can manifest as bone issues in the body, thus Green Calcite is useful for bone, ligament, and joint issues. Jasper comes in many different varieties & this particular stone is called Red Creek Jasper. The cool greens & grays are really soothing & the rich browns and reds give it detail and character. 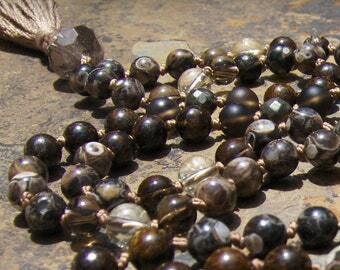 Jasper is a stone of gentleness and relaxation. It brings tranquility, comfort, wholeness, healing, and gentle endings. It is called the Supreme Nurturer and acts as a reminder that one is not here just for oneself, but also to bring joy and substance to others. In the physical realm, jasper is used for the liver, gallbladder, soothing the stomach, and balancing yin/yang energies. 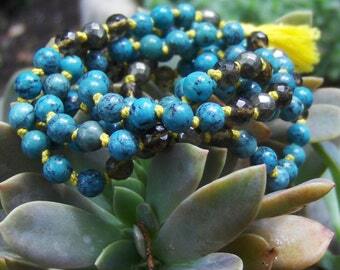 Turquoise is considered to be a bridge between Heaven/Sky and Earth, grounding us while still remaining open to Spirit. Many Native American cultures believe Turquoise helps to connect the mind to the infinite possibilities of the Universe. It is great for removing and releasing old behaviors such as self-sabotage and self-martyrdom that no longer serve in growth. Turquoise is great for working with the Throat Chakra, to foster honest and clear communication from the heart. Use Turquoise to release old vows, express freely, and ease nerves when speaking in public. Tiger Eye is a stone of protection & grounding that enhances integrity, willpower, practicality and correct use of power. It is especially good for “earthy” people & can be helpful for those who seek clarity & confidence. Tiger's Eye resonates with the solar plexus chakra. Sodalite has a strong vibration that will bring your attention to the qualities of idealism and truth. It may stimulate you to live up to your own ideals and ideas, about the nature of truth. It has strong metaphysical properties that may stimulate latent creative abilities and it aids teachers, writers and students to understand the deeper philosophical principles. Sodalite's energy is particularly helpful to aid the development of psychic abilities and intuition. It is excellent for communication and may help with public speaking. It may help you to understand the patterns behind such things as astrology and the tarot. As with all fossils, Turritella is great for all areas of business and can enhance one's environment. It can help one to be more open to change and new ideas. Traditionally, Turritella is recommended for diseases and ailments of the skeletal system, bones, hands, and feet. Agate which enhances creativity and strengthens the intellect, making it a beneficial stone for both students and artists. As a stone of harmony, one of the things agate does is balance yin/yang energy. Agate increases energy. However, because it is a grounding stone, it does not increase energy at all times, but rather enables bursts of energy as needed. In this way, agate is a conservation stone, and enhances longevity. Physically, agate is particularly helpful with tooth and gum issues, stomach problems, physical endurance, insomnia. The 108 meditation beads are 6mm & knotted on silk thread with a hand-tied tassel.